Add some ocean terror to your table with these cool salt and pepper shakers. 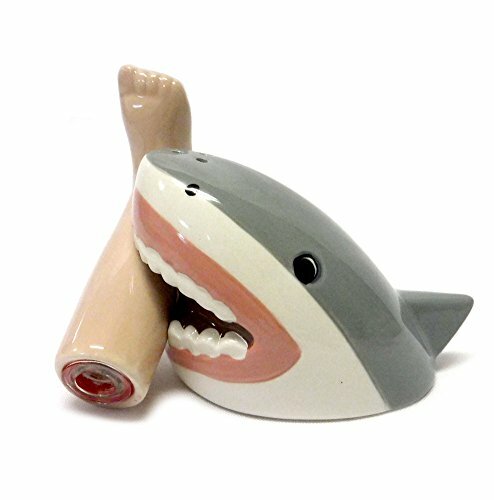 Made out of ceramic, this shark head and foot cling together by embedded magnets so that it appears shark is biting foot. Use to season your food or add it to your collection! Great unique tabletop decor for special dinners or Halloween! Ceramic, expertly painted and fired with a lovely glossy glaze. Embedded magnets keep your shakers adjoined so it appears shark is biting foot. Rubber plugs on bottom of figurines allow for easy filling. Hand Wash (Not Dishwasher or Microwave Safe).